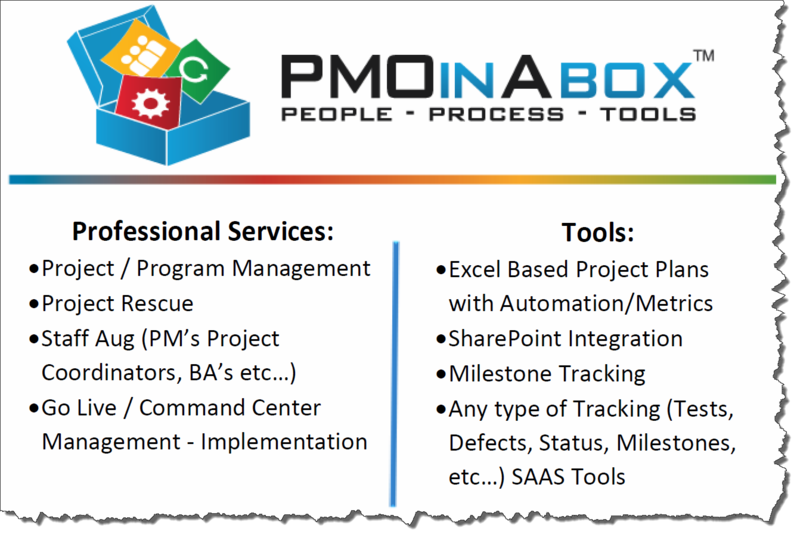 People, Process, Tools - PMO In A Box, Inc. is a company focused on helping organizations (Large or Small) create, fix, manage their Program/Project Management office. We offer a suite of People, Processes, and Tools to help any company successfully implement a Program to manage their projects. Whether they have their own tools and are just looking for help to define and implement a process wrapped around them. We can also create a complete package based around our People, Process and Tools. People: If you are in need of Project or Program Managers, Project Coordinators, or Meeting Administrators, Give us a call. Out SaaS tools is available with any resource that we provide! Call us today for a quick overview to see how we can help you finish your projects. We can help on a per project basis, or help with your entire organizations project management office.